Designed for heavy duty use in industrial, automotive, and light manufacturing applications. They are simple, quiet, and reliable. Atlas Copco's GA VSD+ range brings a game-changing innovation to the general industry. 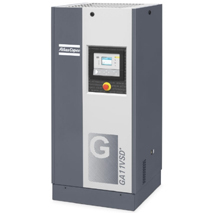 The GA 7-15 VSD+ variable speed drive compressor reduces your energy consumption by a staggering 50% on average, compared to idling compressors. At the same time it offers improved performance, silent operation (down to 62 dB(A)) and a compact footprint, thanks to its vertical drive train design. The heart of the GA VSD+ is an interior permanent magnet motor, directly coupled to Atlas Copco's best-in-class screw element: all of which have been designed in-house and have patents pending. All these benefits make the GA VSD+ the compressor of the future, setting a new standard in the industry for years to come. Oil-injected rotary screw compressors, 15-22 kW / 20-30 hp. Atlas Copco's oil-injected rotary screw compressors are leader in the market thanks to outstanding performance and flexible operation. This results in the highest productivity while minimizing the total cost of ownership. GA compressors are built to perform even in the harshest environments; these products will keep your production running smoothly. 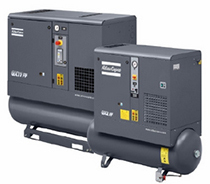 Oil-injected rotary screw compressors, 2-11 kW / 3-15 hp. Atlas Copco's oil-injected rotary screw GX compressors are the powerful and reliable industrial screw compressors for small and medium sized industries. Atlas Copco's oil-injected rotary screw GA compressors are leaders in the market, with outstanding reliable performance. Their flexible operation results in the highest productivity, while minimizing the total cost of ownership. 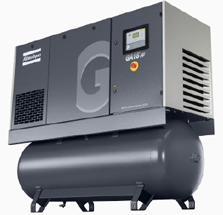 Oil-free scroll compressors, 1.5-22 kW / 2-30 hp. Atlas Copco's SF oil-free scroll compressors provide 100% oil-free for critical applications in industries such as R&D laboratories, hospitals, universities, dental applications, food & beverage. These ISO 8573-1 CLASS 0 certified compressors are easy to operate and maintain, and have a minimal footprint to save space in your facility. 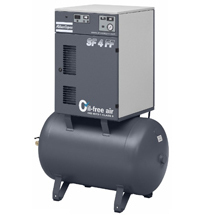 SF compressors eliminate the risks of oil contamination while providing an efficient, reliable and highly cost-effective source of pure oil-free air.